Dr. Kevin Wong, D.O. is a board-certiﬁed Anesthesiologist with fellowship training in Pain Medicine. He received his Bachelor of Science in Biochemistry and Management Science at the University of California, San Diego. He then completed his medical degree at the Philadelphia College of Osteopathic Medicine, and went on to complete his residency in Anesthesiology at Geisinger Medical Center. He served as Chief Resident during his ﬁnal year of residency training. He also served as a member of the American Society of Regional Anesthesia and Pain Medicine Resident Section Committee. Dr. Wong then completed his fellowship in Pain Medicine at the University of Nebraska Medical Center. He received extensive training in the evaluation and treatment of chronic spinal pain and a variety of other painful conditions such as complex regional pain syndrome, chronic abdominal pain, neuropathic pain, cancer-related pain, hip/knee pain, and myofascial pain along with his special interest in cutting- edge technology, speciﬁcally spinal cord neuromodulation therapies. He also published several peer-reviewed abstracts and articles in renowned journals such as Pain Medicine, Pain Practice, and Cancer Research. He also presented at national and regional conferences in areas of pain medicine, anesthesiology, and neuroscience. As an Osteopathic Physician, Dr. Wong focuses on treating the whole patient. His goal is to provide each of his patients with an individualized, comprehensive care plan that tailored to his or her lifestyle and needs. He seeks to manage chronic pain, optimize patient care, and improve patients’ quality of life through a multidisciplinary approach. 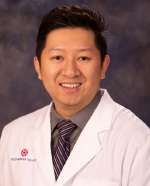 Dr. Wong is an active member of the American Society of Anesthesiologists, American Society of Regional Anesthesia and Pain Medicine, American Academy of Pain Medicine, and American Osteopathic Association. During his spare time, he enjoys traveling overseas, exploring new food, swimming, kayaking, and spending time with family and friends. "Let me take care of your pain so you can get back to living your life."